Angel’s Landing at Zion National Park has been on my hiking bucket list for quite some time and I finally got to do that hike a few weeks ago. Southern Utah is not an easy place to get to, and even fewer people attempt a hike as strenuous as the one to the top of Angel’s Landing. Although I’m not in the best shape of my life, I figured that I am not getting any younger or fitter. 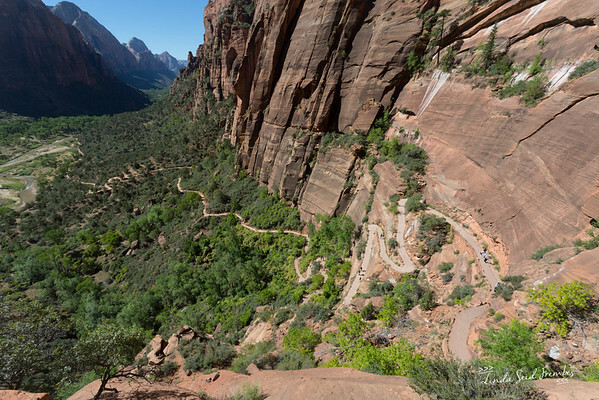 If we came all this way to visit Zion National Park, we were hiking to Angel’s Landing no matter what. Total elevation change: 1,500 feet with steady but steep climbing. 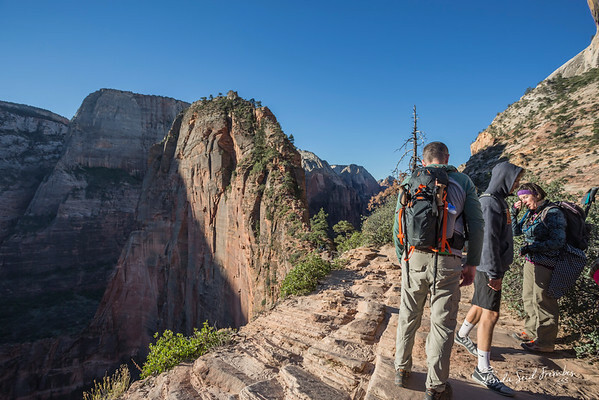 500 feet of that elevation change comes in the last half-mile as you climb to the top of Angel’s Landing. Terrain: Packed dirt and sand with some stone paving on West Rim. Jagged rock face and chains to Angel’s Landing. Distance: ~2.5 miles each way from the trailhead to the top of Angel’s Landing. Rating: Strenuous to very strenuous. Average hiking time: 4-6 hours. We completed the hike in 5.5 hours – 5 hours active and 30 minutes at the top to rest, snack, and take photos. This hike offers amazing views but you have to work for them. Many spots along the first part of the hike offer shade, but much of the hike is full sun exposure. Do not attempt the climb to Angel’s Landing if you are scared of heights, are unsteady on your feet, or are prone to vertigo. The sheer drop-offs on one or both sides as you climb + the 360-degree view at the top will test your ability to stay upright. We began our hike on the 6:00 a.m. shuttle bus from the Zion National Park visitor’s center. Parking within the park at that hour is easy. You drive right into the visitor’s center parking lot and hop on the shuttle. If you are arriving after 9:00 a.m. during peak season, don’t bother to drive into the park as most lots will already be full. Instead, park in Springdale and take the shuttle to the entrance to the park. The hike itself begins at the West Rim Trail, accessible using the shuttle bus system within the park. Take the shuttle to The Grotto bus stop where there are restrooms and water bottle filling stations. Make sure you fill your water bottles to the brim as there are no water sources on the trail. You then pick up the trailhead across the street. The hike begins with a walk through Refrigerator Canyon, aptly named since it gets little sunlight and is pretty cold at 6am in mid-September. Almost immediately you encounter your first set of switchbacks and you begin climbing. The trail is winding at first (see above photo). The most famous set of switchbacks on this hike is Walter’s Wiggles, a set of 21 switchbacks that will totally kill your legs. The Wiggles bring you up and out onto the ridge of Refrigerator Canyon. From there, it’s a short hike to Scout’s Overlook. Here’s a partial view of the Wiggles as we were descending later in the day. It’s much quieter earlier in the morning. Prepare to share space with lots of other hikers if you start later in the day. The view is pretty amazing once you reach Scout’s Overlook and you may be tempted to stop here. You’ll know when you get to Scout’s Overlook simply because of the view of Zion Canyon below. There is a big, flat rock area to hang out and watch the other hikers proceed toward Angel’s Landing. Scout’s Overlook is also where you can make a bathroom stop, although I would caution against that depending on the time of year. When we were there a few weeks ago, the bathrooms were due for their biennial cleaning. Yes, you read that right. The bathrooms at Scout’s Overlook are cleaned once every two years. The trail is shut down and a helicopter is brought in to fly out the waste. We were there the week before the cleaning was due, so we skipped using the facilities before proceeding on to Angel’s Landing. Again, you may be tempted to stop at Scout’s Overlook instead of going on to Angel’s Landing and that’s okay. You’ve already accomplished a tough hike at this point. We saw many hikers who either decided to turn around and head back, or who decided to split up with some going on and others staying at the Overlook. 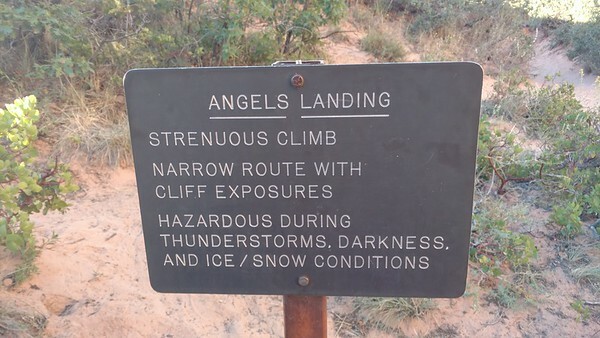 Everything we read about hiking Angel’s Landing was pretty accurate. If you are scared of heights, it is not a safe climb for you. There are many places where a wrong step could land you a thousand feet below where you were standing. But if you aren’t scared of heights and your legs feels good, then keep going. You’ve come so far at this point. Because we started early, we were hiking with some pretty serious and experienced people around us. Everyone was courteous and encouraging since we were going at our usual (slow) pace. When we got to Scout’s Overlook, we could finally see the first thin ridge that starts the climb to Angel’s Landing. I have to admit that it’s intimidating. Here’s the view of the climb, below, with Scout’s Overlook behind you. If you look really, really closely, you can see people on the ridge. Tiny, tiny people on the ridge. What’s Up with Those Chains? 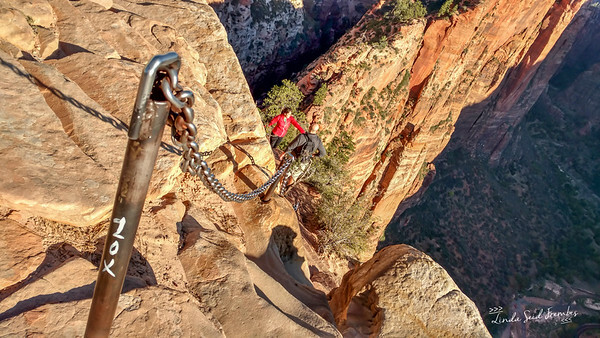 As you notice in the photo above, there are chains along the trail as you climb to Angel’s Landing. The chains are very necessary for this part of the hike. There are points where you will need to use both your arms and legs to get yourself up or down. In places that are tricky to navigate, there are carved footholds as well. The narrowest part of the trail here is about 24 inches wide. Thankfully, it is the one part of the trail where there are chains on both sides of you. 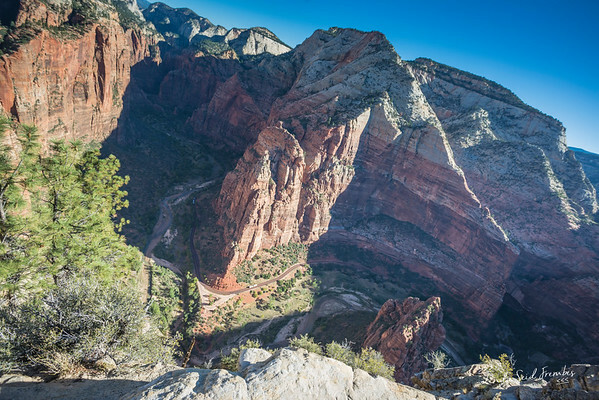 For this last half-mile to Angel’s Landing, there is a chain on one side of you and a 1,000 foot drop on the other. Whatever you do, always make sure that you have a firm footing before you let go of that chain for any reason. The photo above is one of my favorite photos from this entire day. It’s a close-up of the chain on the trail, and you can see not only the steep steps at the bottom of the shot, but also one of the several narrow and long ridges that you have to traverse. Again, I reiterate that if you are scared of heights, unsteady on your feet, or prone to vertigo, you should not attempt this part of the hike. There are several points along the climb that you think you’re almost there – but you’re not. 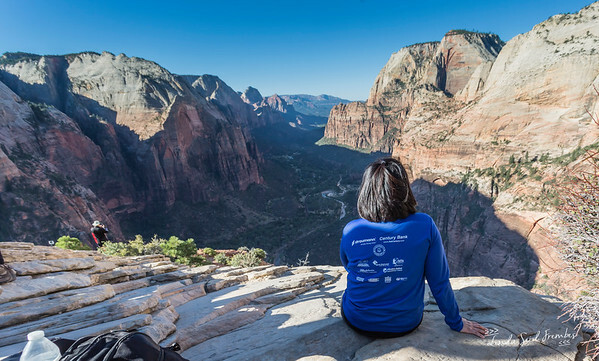 The payoff for all of that hard work is an amazing 360-degree view of Zion Canyon. At this point in the hike, you’ve climbed 1,500 feet (with 500 feet of that total in the last half-mile) and have walked ~2.5 miles. It’s time to have a drink of water, a snack, and to wander around to take photos. The photos below show two of the many views from Angel’s Landing. You can see a shuttle bus on the scenic road in the top photo. In the bottom photo, you can see the Virgin River down below. Tip: Beware the aggressive chipmunks at Angel’s Landing. I am not kidding. I had one try to climb up my leg to get my protein bar as I was eating it. Keep your food protected and make sure you close the zippers of your backpack (that is, unless you want to take one of these critters back down the trail with you). We read every guidebook, blog post, news article, and TripAdvisor review that we could find about hiking to Angel’s Landing. All of them made the hike sound scary and dangerous, and rightly so. This is a technical hike that can result in injury or death if you’re not prepared. Much of this hike is in full sun. We started before sunrise when it was cool enough that we needed jackets. We made good time even though it was still dark and we needed headlamps. The environment in Zion heats up very quickly and the further you can make it while the weather is still cool, the better you will feel. You will need energy for this hike. Pack plenty of water (there are no services on this trail) and salty snacks. This is a tip born from experience. I saw other people who were wearing gloves and I was so jealous! Nowhere did I read a tip to wear gloves, but it makes sense now. The sandstone is very rough and in some places it’s like touching sandpaper. As you climb, it is inevitable that your fingers and/or knuckles will get scraped across the rock. Be courteous and use common sense as you ascend and descend. 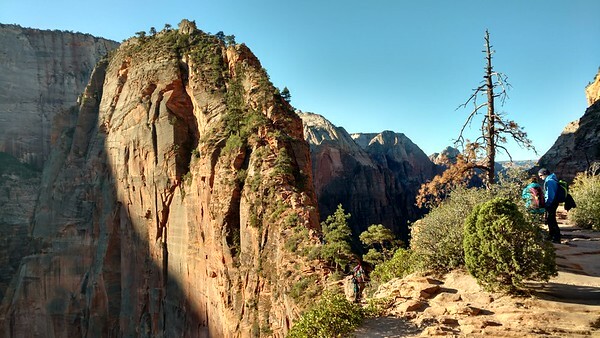 West Rim Trail is super spacious as compared to the narrowness of the hike to Angel’s Landing. I cannot stress enough how dangerous this part of the trail becomes if someone near you is being dumb and either rushing the person in front of them or being pushy in places where there is no space for two people. Stop and enjoy the views. You just made it to the top of Angel’s Landing. Stop and enjoy it. This is a view that many other people in the world will not or cannot see. Take plenty of photos and videos, but please make sure you secure your camera when you’re ready to descend. It’s a long way down if you drop it.